Teeth whitening is the fastest, simplest and most cost effective way to produce a dramatic improvement in your smile. 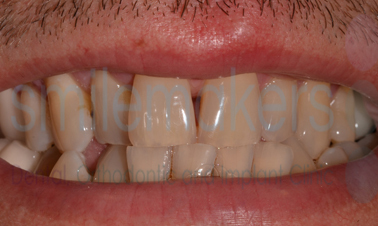 When carried out using the Smilemakers' technique the treatment is painless and the results are guaranteed and long-lasting. John is a successful businessman who interacts with clients on a daily basis. He wanted a fast and simple way to improve his smile without spending much time in the dentist. 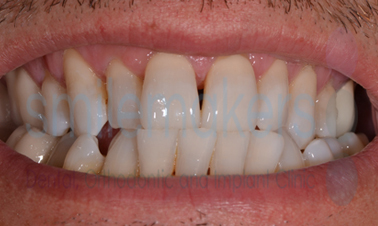 After discussing the various options he decided to try Smilemakers hugely popular trays whitening system. Needless to say he was very happy with the results. Teeth whitening involves bleaching your teeth to make them lighter. The 'active ingredient' in the product is usually hydrogen peroxide or carbamide peroxide which break down to release oxygen ions that gently lift the colour of the teeth. How effective this whitening is depends on the whitening gels, the activators, the structure of the teeth, the time taken, and the technique used. Many products these days make claims to be able to whiten your teeth (for example toothpastes, toothbrushes and sugar-free chewing gums), but the only clinically proven way to genuinely whiten a tooth is to use professional tooth-whitening bleach. The General Dental Council, the organisation that regulates dental professionals in the UK, has decided that teeth whitening is a form of dentistry. This means that you should only have your teeth whitened by a dentist or another appropriately trained dental professional such as the hygienists at Smilemakers. You can also buy DIY home teeth whitening kits but these may carry risks and are not advised. What is involved in teeth whitening and how long does it take? Take-home whitening trays can be made from impressions of your teeth. You then wear these, with the whitening gel inside, for anything from a week or 2 to a few months depending on the darkness and porosity of your teeth. In-surgery whitening involves having a more concentrated whitening gel painted onto your teeth in the dental surgery, sometimes accompanied by a special light to help activate the gel. The process takes roughly an hour but you will often need take-home whitening trays in addition because the desired whitening cannot be guaranteed to occur in the hour. At Smilemakers we provide the world-leading Enlighten™ and Zoom™ whitening systems.